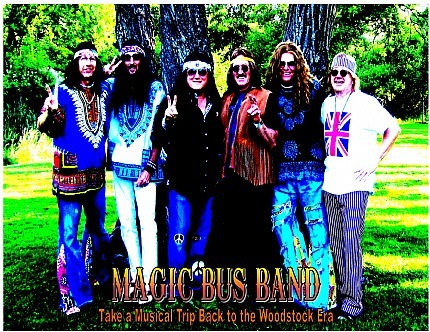 Enjoy a musical trip back in time with Magic Bus band. As one of the only bands in the United States offering a music performance replicating the greatest hits of the late 60’s, you’ll believe you’re watching 30 separate original groups performing their hits. The music of Small Faces, Bubble Puppy, Grass Rots, Three Dog Night, The Who, Crosby, Stills, Nash and Young will appeal to all generations. Their authentic stage presentation, which includes members fully costumed, will transport everyone back to an era of music that represents the age of beads, flower power, headbands, peace signs and the greatest outdoor music festivals. Voted #1 local band in 2011, 2012 and 2013 in WDIV’s “Vote 4 the Best” contest and voted #1 in Detroit’s “Hour Magazine”, Best of Detroit in 2012, now is the time to experience the Magic Bus phenomenon.